In the Article entitled “Amazon’s app will use AR to convince you to buy all the things” by Mashable, they optimistically discussed the current state of Augmented Reality by e-commerce giant, Amazon. If you have an iPhone and the Amazon app, you can use AR to envision real world products in your home before you buy them. Amazon shoppers are in bliss and e commerce non-believers are feeling a sense of hope. This new phenomenon is changing the way we shop and communicated with the ecommerce world. AR is making it easy and fast to buy products without ever having to leave your home. No more pushy salesmen or spending hours on in researching which stores carry that “must have”. While I am a big online shopper of clothing, like most, I’ve always been a bit apprehensive about buying furniture and décor online. This capability eliminates any doubt you may have about products. This is revolutionary, but also a bit scary. 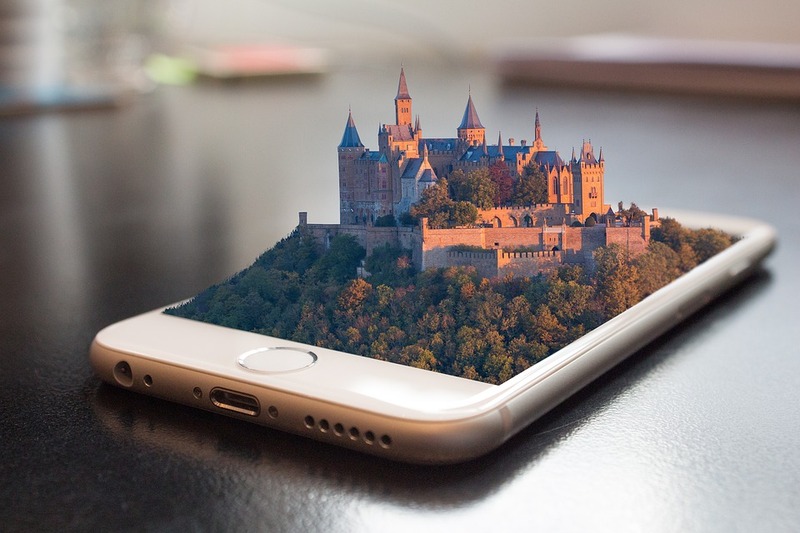 What does AR capabilities mean for traditional brick and mortar shopping stores? What does this mean for traditional customer service professionals? Are modern technologies promoting a more individualistic society? I’m all for technological advancements making life more simple and efficient, but I can’t help but consider the ways in which this will affect our current ecosystem. Well, folks, it looks like the wait is finally over. November 3rd, 2017 marked the release of Disney and Lenovo’s Jedi Challenges augmented reality headset. Priced at $199, this device is far more affordable than the late Oculus Rift ($599) or the Sony PlayStation VR ($399). Jam packed with over 12-hours of gameplay across six planets and three experiences–Lightsaber Battles, Strategic Combat and Holochess–users will find themselves engaged in fantasy replicating Lightsaber battles with the likes of Darth Vader, Kylo Red, the Grand Inquisitor and other surprise villains. Star Wars will always hold a special place in my heart, and I hope to one day sample this headset. Even so, the continuing development of the virtual world leaves me with questions about its implications on humanity. Some educational settings employ the use of VR for open-heart surgery simulations so that students can operate on subjects risk free. I wonder though, if by using the aforementioned simulations, we run the risk of under-preparing future doctors, scientists and the like for truly associating their subjects with humanity as their practice crosses over from virtual to reality. Kasey Panetta discusses three emerging technology mega trends: AI everywhere, transparently immersive experiences and digital platforms. Panetta offers examples of each and reviews the influences on the future of business. Panetta states, because of the great impact of these trends, it is vital for business tech innovation leaders to explore these ideas. Bitcoin and Ethereum were not new revelations for me when I came across it in this reading. Talk of cryptocurrency (especially Bitcoin and Litecoin) arises at least 2-3 times a week in my household. Cryptocurrency was first explained to me by my boyfriend in September; he has steadily been monitoring the trends and made purchases of Bitcoin and Litecoin since then. Cryptocurrency is a decentralized digital payment system. Bitcoin was first introduced in 2009. Back in September of this year, the price of one Bitcoin was approximately $3,500. As I’m writing this post, it is over $8,000. In a matter of two months it has more than doubled, reaching new highs every month. Bitcoin was first introduced in 2009. 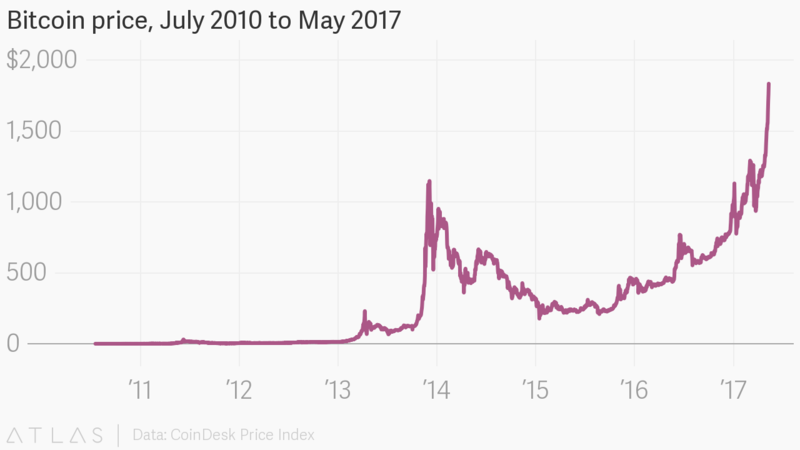 With the rise of Bitcoin, newer cryptocurrencies have also emerged – Ethereum in 2015 and Litecoin in 2011. The stability of cryptocurrency is of concern because the price is constantly fluctuating. It is very difficult for investors and businesses to accept cryptocurrency transactions due to the high volatility. It can have swings of 10% in a matter of minutes. I think Bitcoin and other cryptocurrencies will be part of our future and become more widely accepted once they are stabilized. Sci-fi tech within our lifetime? I fell in love with the sci-fi genre the first time I saw Star Wars in the 1980s. For hours after any futuristic flick, my imagination flies as I picture using technology in movies like Robocop, Terminator, The Matrix, Minority Report and so many more. As I read Top Trends in the Gartner Hype Cycle for Emerging Technologies, 2017, I felt a sense of that excitement return after reviewing (and Googling) all the emerging technologies listed in the hype-cycle graphic. I’ve been giddy for years to see if autonomous vehicles will truly allow me to ride by myself in a car without paying attention to the road, like in Minority Report. Writer Casey Panetta says the technology is about 10 years away. By then, the technology will be in a “plateau of productivity” where mainstream adoption becomes a reality, according to definitions found in a separate reading. The brain behind autonomous vehicles is artificial intelligence, one of the three top trends in Panetta’s piece. Her infographic also shows that “artificial general intelligence,” when a machine is able to do any task that a human can do, is about 10 years away. Kate Baggaley of Popular Science offers a longer time table to achieve general artificial intelligence. She writes the technology could be 25 years away, and today computers can’t behave or compute a six-year-old level. Thankfully, I won’t be seeing any Terminators any time soon. The Hype Cycle, Tesla, and VR: Who is it Good for? People are desperate for the new, and willing to overlook almost any current issue if the future seems bright enough. Take two recent tech news items, one from China, and one from the US. On Kickstarter, a small Chinese company that has never brought a VR product to market raised 2100% of their kickstarter goal for a VR headset. In the US, Tesla revealed its 2nd Gen Roadster, and an all-electric Class 8 Semi truck to great fanfare, despite being months (if not years) behind on delivering on their first major consumer product, the Model 3. Tesla seems able to redirect the public’s attentions to the “peak of expectations” of each new class of products they promise, then jump to the next peak of hype for the next product without fully (or at all) delivering on the promises of the last hype cycle they generated. As they seesaw from home roofs to village battery banks to spaceships to subways to heavy trucks they grab massive attention, but the bounce back into the “plateau of productivity” eludes Tesla on almost all it’s projects. Around VR the hype is even worse. To trust an unproven company to deliver a next-gen product relying on immature technology at a rock-bottom price is an investment no single rational entity would make. But not only did the crowd do this, they did it to the tune of 21 times the amount the cash requested. Is this good for business, the consumer, or tech in general? If There’s Nothing New Under the Sun, Who Owns the Sunshine? In both the TED Talk Embrace the Remix by Kirby Ferguson and Brett Gaylor’s documentary RIP! : A Remix Manifesto, the focus is on the creative process involving the copying, transforming and combining of established intellectual property into new forms of expression. Ferguson and Gaylor refer to the concept as remixing. And in many cases, it’s in direct violation of U.S. copyright laws. Technology has an inherently adversarial relationship with the notion of intellectual property ownership. The casualties in the battle are many; artists believe their creativity is stymied by the threat of legal action. Everyday citizens are persecuted with fines or settlements that are wildly disproportionate to their “crimes.” Creators of new products, drugs and technology are hunted by patent trolls. Ultimately, the advancement of the greater public good can be obstructed. Remix artist Gregg Gillis (aka Girl Talk) believes critical mass makes this unlikely. There are just too many people remixing, reusing and recreating copyrighted materials for media companies to come after every citizen. “It’s back in the people’s hands for the first time in a long time,” Gillis says in Gaylor’s documentary. A quick look at new media platforms supports his conclusion. Memes, which often include copyrighted images, are routinely embellished by users and end up going viral on social media. YouTube users upload 60 hours of video every minute, much of which may skirt the edge of infringement. Collaborative media projects – including the RIP! : A Remix Manifesto documentary itself – yield new artistic expressions that celebrate the spirit of elaboration and evolution. Regardless whether copyright laws remain intact or are altered to meet the current technological climate, remix artists of all stripes likely will continue to step into the sunshine. In the film, “RIP: A Remix Manifesto”, the director and creator of the documentary took a deep dive into the word of “mashups” and copyright infringement laws. A “mashup” is the act of sampling numerous songs (from any genre) and creating a single body of work. The director argues that copyright restrictions are out of control and have been manipulated for profit at everyone’s expense. In the film, they concentrate on a set of propositions called ‘A Remixer’s Manifesto’ written by Lawrence Lessig. These principles are used to support the argument that copyright restrictions are too harsh and unreasonable. These propositions are as follows: 1.) Culture always builds on the past, 2.) The past always tried to control the future, 3.) Our future is becoming less free, 4.) To build free societies you must limit the control of the past. While I agree that there should be some copyright restrictions to protect original art, I believe that an artists creativity should not be stifled by restrictions that prohibit creatives to build on previous culture. I firmly believe that artists from Grandmaster Flash to Walt Disney, would attribute much their success to creative freedom in the world of mashups. These artists are creative strategists. Creative strategists identify bodies of work and give it new life and meaning. While the original artists and copyright laws may not be keen to this, mashup artists should be acknowledged and considered as laws are identified and implemented. Today, mashups are shedding light on social issues and to provoking laughter and activism. Are copyright infringement laws stifling creativity within public domains or is it simply protecting the legal rights of artists?